Mount Everest is melting. I haven't heard anything about this in the mainstream media, but there's a small sidebar in an old issue of National Geographic Adventure magazine from May 2005! 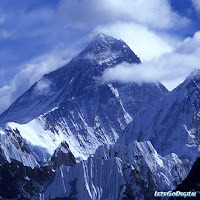 "You can't look at the top of Everest and see it melting. Up there, it seems like the mountain will have snow forever. But the lower slopes are definitely thawing. The glaciers on it have retreated considerably, and in the valley below Everest, the meltwater has formed a lake that didn't exist 50 years ago. Hundreds of these meltwater lakes have formed throughout the Himalaya." "The Khumbu Ice Fall is warming up and becoming unstable, which makes it more dangerous than before. But, ultimately, the scientists we worked with were more concerned about the effects of warming on the local Sherpa people. Take Imja Lake, for example. It has a moraine dam with an ice core holding everything together. If that core melts, the 30-million-ton lake will wipe out the Khumbu Valley and its inhabitants. It's a time bomb just waiting to explode." Watch this short video by mountaineer and filmmaker David Breashears, as he shows his photographic evidence of the shrinking of glaciers in the Tibetan plateau surrounding Mount Everest.